In an earlier post I outlined the reasons why you should blog about your internship, and now I’m back to share some guidelines on how to successfully publish a post about your experience. Here are six steps to help you start blogging and making the most of your internship. 1. Check out your company’s social media policy. First, make sure that you follow all the rules. Ask your manager if there is a social media policy for employees — and this is a good thing to do whether you intend to blog or not. Some social media policies govern how you should communicate online when you are representing the company, and some get a little more detailed and deliver guidelines about the type of conduct expected from employees at all times. Know what is expected of you! Asking about this shows that you’re engaged and enthusiastic, as well. If they don’t have a social media policy, recommend they put one together for bonus points! 2. Pitch your plan and get buy-in from your manager. Use the conversation about social media guidelines to ask your boss if they would be open to your writing a blog post about your experience. 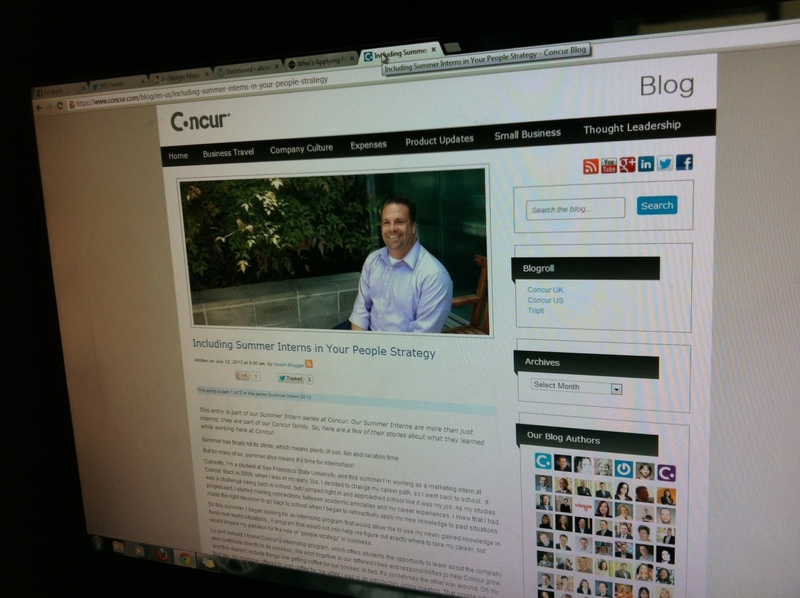 Offer to blog for the company’s site as content for drawing customers. If they’re not comfortable with that, ask if it’s okay to write about your experience and post it on your own blog. If that’s not okay, ask if you can blog about your experience without naming or alluding to the company’s name or business. My gist here is that there is always a way, and you don’t necessarily have to take “no” for an answer. Something might have been brewing in the back of your mind since your first day on the job. Maybe it’s a topic you studied in one of your classes, and you want to talk about how you’re applying it to your work. Just make sure you’re interested in it and you have something to say about it. Even better if you have a unique insight to add! If you’re going to help the company increase traffic to its web site, ask yourself, “What are the company’s customers searching for? What are they interested in?” You can add value by touching on one of those subjects. What connections can you draw between those topics and your unique experience as an intern? If the company engages in content marketing and you’ve got the green light to write a post for the corporate site, set up a meeting with the Content Manager to see if they might have an idea or assignment for you. Or, just write about your experience with the company’s culture! There are around 560 million articles out there about how to write a good blog post (seriously, according to Google) so I won’t belabor those points here. Just be sure to keep your tone personable, positive and smart. You definitely want to set your best foot forward. Ask friends and your manager to read your work and give feedback. Take their advice. Although accepting edits can be hard sometimes, it’s an important skill and the results can transform your writing into something greater than it was before, no matter how good a writer you think you are. Strive to avoid taking edits personally; I speak from experience! Also avoid taking it personally if your idea or your post gets rejected entirely. Ask for feedback and try again! Having a post go live and watching page views go up and up can be exhilarating, but don’t stop there! Post to Facebook, Twitter, Google+ and LinkedIn. Tweet or email your post to your school’s social media managers as well. They may want to share your post on their official social media channels. And don’t forget to respond to comments your post receives. Now that you’ve got your feet wet, keep your mind open to your muses and be ready to pitch your next brilliant post to your managers. You might be the next big blogger! Regardless of where your post is published, you’ve reached several important milestones in your internship once you’ve gone through this process. You’ve demonstrated your ability to come up with ideas and pitch them in a business setting. You’ve communicated your ideas and insights via the written word in a specialized format. This accomplishment can go on your LinkedIn profile, on your resume, and you can talk about the experience as something you’re proud of in your next big interview. Now get out there and do it — and feel free to reach out to me if you need advice. Don’t forget to come back here and share a link to your post in the comments so we can all congratulate you on your hard work! very nice tips about internship. post about your internship experience | alicieinwonderland <Loved it! Switch Idea is where you can get internships very easily and upto your mark. So please login to it and make your Vcard, Fill up your profile & Resume details. Get the best Internship. excellent post, very informative. I’m wondering why the opposite experts of this sector don’t understand this. Generally, internship is a method of on-the-job training for white-collar and professional careers. Internships for professional careers are similar to apprenticeships for trade and vocational jobs. Although interns are typically college or university students, they can also be high school students or post-graduate adults. On occasion, they are middle school or even elementary students. In some countries, internships for school children are called work experience. Internships may be paid or unpaid, and are usually understood to be temporary positions. I am highly impressed by this article. Thank you for sharing. Excellent tips, Dwayne, thank you!